Dr. Jekill & Mr. Hyde | The Exhaust: the leading electronically adjustable exhaust system in today's market with full European type approval. Dr. Jekill & Mr. Hyde | The Exhaust offers the rider the possibility to choose between three different performance modes. Dr. Jekill & Mr. Hyde | The Exhaust does not only performs great, it also needs to be a reliable and high quality product. The Exhaust is the result of German engineering and Dutch craftsmanship. Our exhaust systems fully comply with the latest EURO standard. We care a lot about the environment, so all our exhaust systems are built to achieve air quality standards. Twenty years of innovation, state-of-the art engineering and craftsmanship. Twenty years to create the ultimate sound experience. This is it. Our love for design, eye for detail and passion for sound all comes together in The Exhaust. The electronically adjustable exhaust system makes it possible to choose between three different riding modes while riding your motorcycle. At the push of a button. The Exhaust has three different personalities: the Dr. Jekill mode, the dynamic mode and the Mr. Hyde mode. At the push of a button. Performance. Craftsmanship. Power. 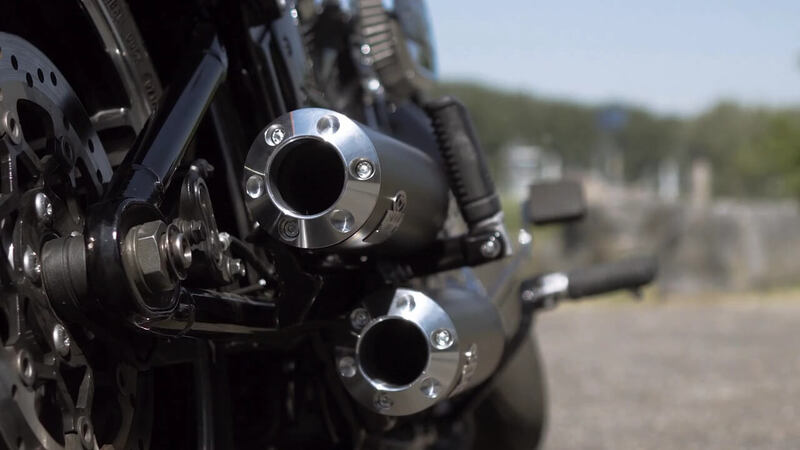 See how and why we created The Exhaust and design your own custom design! Dr. Jekill & Mr. Hyde | The Exhaust is a completely street legal system and complies with European legislation and laws.